First and foremost, all remaining federal EduJobs money must be expended by the end of next month. These funds employed 5,449 school personnel as of December 2011, as reported by the Department of Public Instruction here. DPI’s Recovery Act funding tracker shows approximately $34 million remaining as of June 29th, but since these numbers are both unaudited and missing data for the months of July and August, it’s likely the state’s $297 total award has been almost entirely expended on schedule. State lawmakers did not “fill in” the schools’ funding gap resulting from the expiration of these funds. However, they did reduce the large, recurring state cut to public education called the LEA Adjustment by $143.3 million in this year’s budget, to about $360 million – down from its budgeted increase to $503 million. The total “flexibility” cut now stands at about $55 million deeper it was three years ago, in FY2010-11. DPI has helpfully provided an estimate of what this particular cut means on a district-by-district basis, which is available here. The resulting question arose as result of these budget shenanigans: do public schools actually have more, or less, money to work with this year than last year? The answer is less – to the tune of $190 million (click here to see how). Despite this fact, a recent AP article downplayed the effect of state spending cuts on school employment, but the numbers it cited don’t make that case. Other press coverage from around the state has offered evidence of budget cuts hitting home, in Gaston County schools, Rowan-Salisbury schools, Watauga County schools, and now in the Wake County schools, which will seek a school bond issue in 2013 to meet the capacity needs of North Carolina’s largest and fastest-growing school district. As for the number of jobs in North Carolina’s schools, there are thousands fewer now than before the Great Recession, and the loss of school jobs continues as budget cuts deepen and persist. As of FY2011-12, there were 11,833 fewer school personnel in North Carolina than there were in the last school year before the Great Recession (FY2007-08). Claims made in this year’s legislative session that the FY2011-12 state budget added 2,000 teacher jobs didn’t hold up under scrutiny, and it appears likely that misunderstanding and misinformation about school employment and its direct relationship to budget decisions will continue to thrive through this election season and beyond. 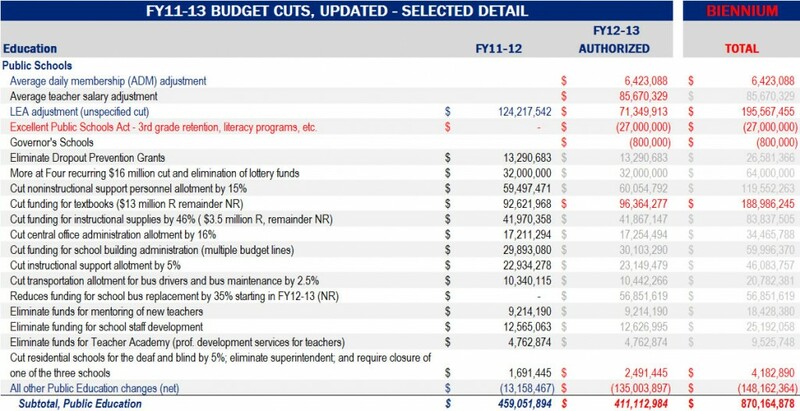 Also, here’s a nifty summary of cuts made to the K-12 budget through the FY2011-2013 biennium. (Trick to reading this is that positive numbers = cuts, and negative numbers = increases, just FYI). There was more than just operating money and jobs, though – including a push to allow corporations to avoid paying taxes by funnelling contributions to special funds for private school scholarships, and a series of major policy changes around literacy in early grades and third-grade retention. That’s all for now … but stay tuned for more.